Track down memory leaks, N+1s, slow code and more. For Ruby, Python, & Elixir. In many cases, Scout is able to track problems down to a line-of-code - and if the optional Git integration is enabled - the developer and commit date. Scout is distributed as a Ruby gem, Python package, and Elixir Hex package. Ruby: supports Ruby on Rails 2.2+ and Ruby 1.8.7+. Elixir: Phoenix 1.2+ and Elixir 1.3+. Python: Django 1.8+ and Python 2.7 and 3.4+. Once Scout has been added a SCOUT_KEY setting will be available in the app configuration and will contain the the authentication key used to report metrics to your Scout account. This can be confirmed using the heroku config:get command. heroku config:set SCOUT_NAME="YOUR_APP_NAME - YOUR_ENVIRONMENT"
Once installed, the scout_apm library will automatically trace your app’s web endpoints and background jobs. Popular libraries (ActiveRecord, Redis, Net::HTTP, etc) are automatically instrumented. scout_apm reports timing and memory allocation metrics every minute to Scoutapp.com via a background thread. 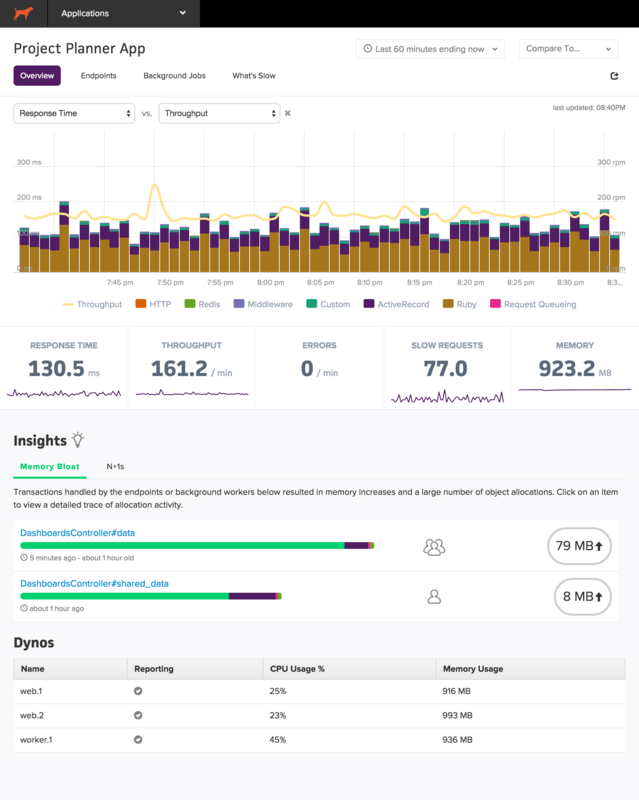 The Scout dashboard is the entry point to your app’s performance analytics and Scout’s performance insights. or by visiting the Heroku Dashboard and selecting the application in question. Select Scout from the Add-ons menu. The Scout dashboard is divided into two areas: Key Performance Indicators and Insights. More on those are below. The top section of the dashboard displays an auto-refreshing view of key application health metrics. You can view metrics across a wide time range and compare performance to previous time periods. Scout continually analyzes your app’s request behavior, identifying areas that may be leading to stability and performance issues. The result of this analysis is displayed on the dashboard beneath the key performance indicators. 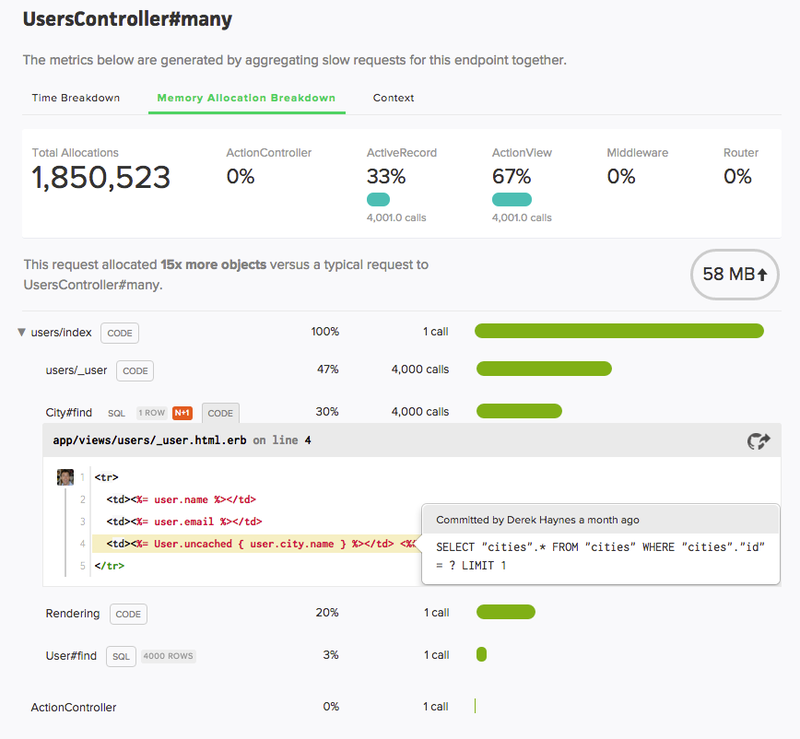 If a user triggers a request to your application that results in a large number of object allocations (example: loading a large number of ActiveRecord objects), your app may require additional memory. The additional memory required to load the objects in memory is released back very slowly. Therefore, a single memory-hungry request will have a long-term impact on your app’s memory usage. The Insights area of the dashboard identifies controller-actions and background jobs that have triggered significant memory increases. An overview of the object allocation breakdown by tier (ActiveRecord, ActionView, etc) is displayed on the dashboard. Scout can track deploys, making it easier to correlate changes in your app to performance. Enable Dyno Metadata to begin tracking deploys. This adds a HEROKU_SLUG_COMMIT environment variable to your dynos, which Scout then associates with deploys. By default, Scout tracks the time spent in database queries for each transaction and displays individual queries in transaction traces. For additional database insights, the database monitoring addon can be enabled. The addon is 25% of your Heroku plan. For example, if your app’s Scout plan is $59/mo, the database monitoring addon is an additional $14.75/mo. Scout’s database monitoring plans aren’t visible from our public listing page to remove noise. Upgrade instructions are available in the Scout UI (generally, just append “-db” to the name of your plan, so “loveland” becomes “loveland-db” to use the database monitoring addon). Scout can be configured via Heroku config variables. View the configuration options for Scout. 3. Check the output for any obvious errors. If you are stuck, send the output of the log stream to support@scoutapp.com along with the URL to your app (ie - https://apm.scoutapp.com/apps/ID). Scout can be removed via the CLI. A transaction is a single web request or background job. If your app exceeds the per-day transaction limit for your subscription plan, transaction traces will be inaccessible for the remainder of the day. Monitoring of high-level metrics continues and trace collection resets on the following day. All Scout support and runtime issues should be submitted via one of the Heroku Support channels. We encourage you to send product feedback to support@scoutapp.com.